Sunny days are not just for packing yourself in a locked air-conditioned room. It’s the time to lace up your boots and get out for spending quality time with friends. Also, prepare yourself for exciting outdoor activities from weekend outings to road trips. In the meantime, you have to face many wardrobe malfunctions as summer brings some much challenges. You might be thinking, what to wear, or what not to? Which one will be comfortable and lightweight? Well, it is the time to plan for next summer gateway and shirt comes in the list first. Before purchasing the best shirt for hot weather, staying calm and comfortable should be your top priority. The market is full with several variations so you might get confused till now. To reduce your confusion, we’ve listed ten best shirts for hot weather. Stay with us to know more about them. Hot weather is devastating, especially for hikers and mountain climber. Weather forces you to take the necessary preparation to stay cool. Everyone dressed like, it is beach time. You’ll never see a hiker without wearing a shirt as it protects them from harmful sun rays. The best shirt will assure the coverage and comfort during extremely hot weather. Keeping all these in mind, we made a list of ten best shirts for hot weather. We believe you’ll love all of them, still have a brief look over them. 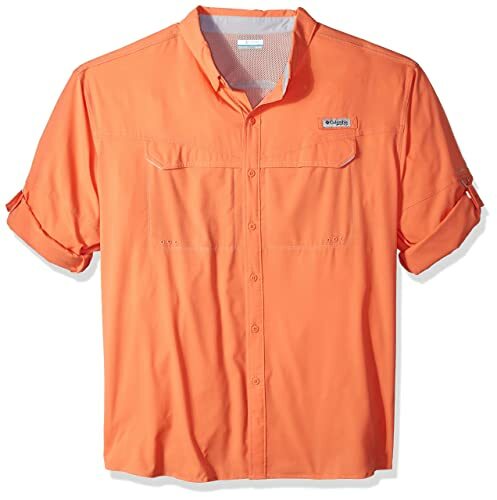 Columbia PFG brings a stylish shirt for men with a comfortable feeling. This one comes with all the excellent features at an affordable price. The shirt is made with 100% Tactel Nylon material. The material includes an Omni-shade UPF 30, which blocks UVA and UVB rays to damage your skin. You can stay long under the sun without any harm. Though it comes with a long sleeve but its adjustable button allow you to convert the long sleeves to the short one. This would add comfort to your journey in hotter days. Besides, it features hidden vent at shoulders for breathability. Also, the nylon quick-dry fabric assures the sweat absorption for more comfort. 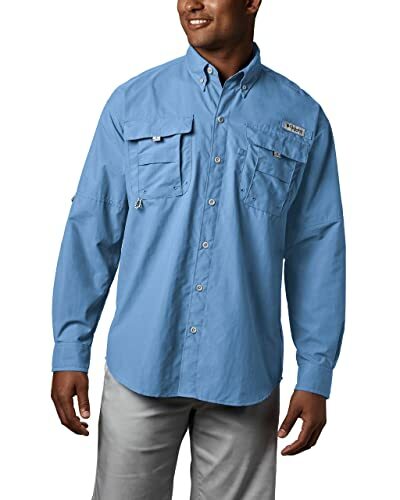 Columbia PFG allows free movements or activities due to the lightweight fit. In a word, you can rely on this Columbia PFG, and it won’t disappoint you at all. Indeed, it’s a perfect day-out accessory for summer within range. Pendleton always stands for quality and beauty, which is a top seller of branded shirt since the 1950s. Feel their softness of luxurious and world-class clothing with Men’s long sleeve broad shirt. The shirt is equipped with 100% wool; which means you’ll feet extreme softness. 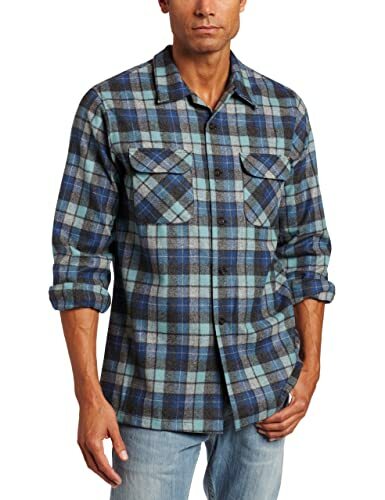 This imported quality shirt is made in the USA as Pendleton is America’s top heritage brand. It features a button closure for comfortable wearing and better comfort. The shirt is compatible with machine wash; the quality won’t break even after the wash.
Additionally, its spread collar and button down option will add extra comfort in your day. It allows you to store your necessary things in the button-front placket and dual chest pockets. This classic collection is the best woolen option for your needs. Moreover, it comes at a quality price. It shouldn’t be a big deal to buy a quality shirt at a quality price. Grab your one before STOCKOUT! Another collection from Columbia in the list. The men’s Tamiami is designed to assure maximum comfort in extreme weather. Apart from the convenience, this shirt is lightweight as well. Columbia Tamiami is equipped with polyester material with advanced UPF 40 protection from sun rays. This material is extremely breathable as well and protects your skin from sun rays. The shirt can easily throw moisture out and dries faster. Also, it antimicrobial feature protect from bacteria growth and prevents the odor. As a result, you’ll stay fresh for long day fishing and hiking. 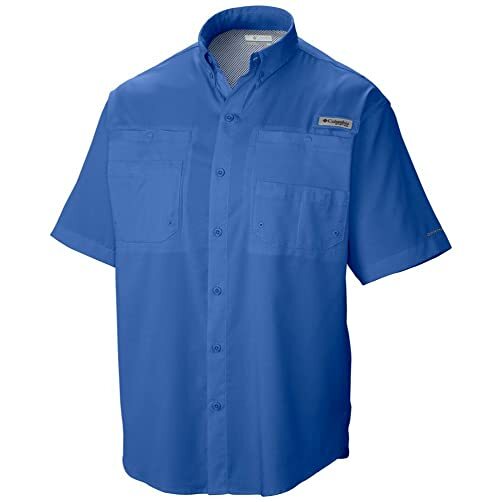 This ultra-light shirt includes a short-sleeve with button-up option for more comfort. Besides, it’s four chest pockets have enough space for more storage. It’s mesh-lined venting at the center back adds extra in the shirt. The shirt is available in a different color that gives you a versatile look. This is one of the best shirts for hot weather which is available right now at an affordable price. 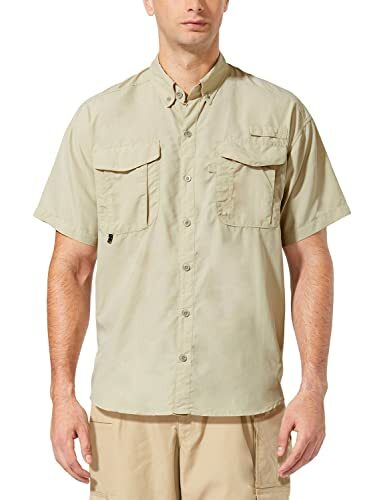 Looking for a comfortable shirt for fishing and hiking? This Columbia Tamiami S/S is the best option for you. 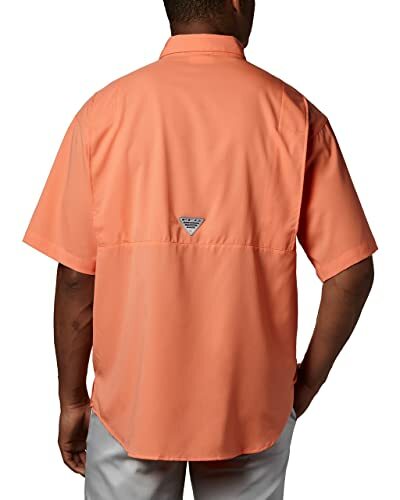 Columbia shirts are attractive among people due to its triangular logo in the middle of the back. Also, a logo in the front is printed in a Velcro strap. These logos are visible, and people will ask about the brand. The pockets with extra storage are entirely different than a typical pocket. You can keep your fishing gears, and it has a small hole to make sure water goes out during sudden rain. There is nothing new to talk about its material. The polyester material features Omni-shade UPF fabrics that protect you from the sun. Besides, its Omni-Wick technology pulls the moisture out to keep you dry and fresh. It comes with a classic fit which is lightweight and comfortable enough for maximum activities. Also, you are getting this at a reasonable price. Hurry Up! Collect your one! One of the most stylish options with built-in sun protection available in the list. The clean lines and delicate design make Columbia low drag offshore shirt’s look sharp in any situation. The Polyester ripstop material combines with Omni-shade UPF 40 that protect your skin from sunburn. The latest Omni-Wick technology helps to move moisture from your skin to the fabric. It keeps you fresh through strategic venting that promotes air circulation. The antimicrobial properties always keep you clean and dry even after multiple wearing. Also, the ultra-fast drying technology assures the fast-drying of showers and splashes. You can roll-up the long sleeve into the short sleeve for a casual look. The pockets here are entirely different than previous ones. However, the brand logo in the center back and the chest will grab people’s attention. The perfect choice for people who loves light colors. 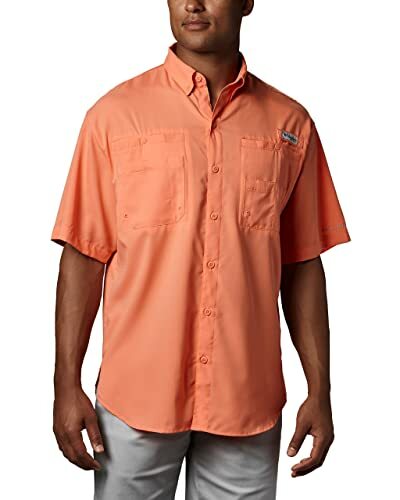 Columbia is providing universal sizes of this offshore shirt for everyone in a family. Also, the price is reasonable as well. An angler friendly and adventurous design from Columbia to keep your mind fresh and focused. Men’s super bonehead shirt offers the maximum comfort and elegant looks. Nothing is more comfortable than cotton, so as in this classic shirt. This classic long sleeve shirt is equipped with a soft cloth which is made for comfort. The shirt is embedded with Omni-shade UPF 30 for ultimate sun protection. Mesh-lined cape vents on the back shoulder of the shirt to assure the air flowing. The shirt features roll-up sleeves along with a tab holder to allow you to adjust the sleeves. It includes four hook-and-loop closed fly box pockets and a tool holder. Pockets are capable of carrying all the essential things that keep your hands-free. The loops in the pocket help to release the water if it goes into the pocket. Above all, the full collar with a stylish button in the shirts adds extra in the sweater. This exclusive option is also available at an affordable price. From park to the docks, get an adventurous feeling with the Columbia men’s silver ridge lite short sleeve shirt. It’s a perfect option in your spring wardrobe with a unique collar and two chest pockets. 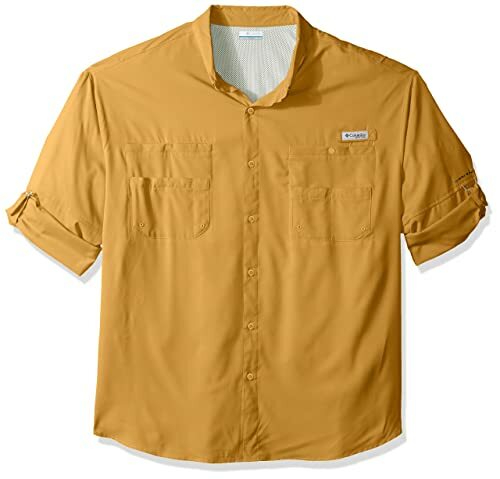 This versatile trail-shirt features a cool-wearing fabric with UPF 40. This quality fabrics protect your skin from the sun and keeps you cool from inside. The hidden back vent on the shirt provides the proper air circulation. Its wicking fabrics pull the moisture away from your body. So, the sweat can evaporate quickly, and you can stay fresh for long. The adjustable short sleeve features a front button closure and button-down cuffs for optimum comfort. This pure cotton shirt provides a classic fit for everyday use. Besides, the fabrics inhibit the bacteria growth to keep your skin healthy and safe. This standard option is available within your budget. You should have a look over this. This big Tamiami II shirt is almost the same as the previous one with a slight change in size. Columbia brings this quality shirt with advanced technology. This advanced technology shirt is made with polyester material. This material protects against the sun due to the Omni-shade UPF texture. Its Omni-Wick technology keeps the moisture away to keep you dry and fresh. Its short sleeve can be folded during extremely hot weather for extra comfort. This shirt allows you to do maximum activities. Its handy chest pocket allows you to store whatever you need for an outing. The shirt features a mesh-lined vent at the back that assures ultimate breathability. Like the previous one, it’s a perfect choice for long days out. Also, the price is reasonable. GO! Check the store NOW! Columbia Tamiami II is a lightweight option for hikers, bikers, and anglers. This sportswear you to be a part of the trend with their stylish and colorful collections. The shirt is equipped with a quick-drying Ripstop polyester to keep you fresh and cool. Its stretchy feature allows the enhanced range of motion with your moves. The Omni-wick quick-drying fabric assures the faster drying to keep your fresh. Like other Columbia, it protects you from the sun and other harmful rays. The antimicrobial inhibits the bacteria growth and keeps the cloth odor-less. That means you can wear the shirt multiple times if you leave home for a few days. Apart from that, the bendable sleeves give you the freedom to choose among formal and casual look. Besides, the mesh-lined cape vents at the back shoulder assure maximum airflow. Indeed it is the colorful and comfy option for everyone in a family. Several size option is available at a reasonable price. So it’s time to explore the summer. A new name in the last of our list, Baleaf Men’s outdoor wear is a comfy option for outdoor activities. Apart from the outdoor activities, it is the best travel wear and recommended by many people. This outdoor wear is woven from nylon lining which is comfortable enough. Unlike others, its UPF 50+ assure excellent protection from harmful UV rays. This lightweight and moisture-wicking fabrics keep you fresh and cool. The shirt’s collar flips up that protect your neck from sun rays. The adjustable sleeves can be bent for convenience. The two utility pockets in the chest with hook-and-loop closures for extra storage. Its back ventilation with mesh-lined back yoke assures proper air flow. The shirt is easily washable in the machines. For easy hanging, the shirt includes an interior locker loop. Upshots, this lightweight and moisture-wicking shirt will ensure a perfect weekend. Also, you’ll feel like wearing nothing, so there is nothing better than this. This is probably the lowest priced shirt on our list. Enjoy the weekend. Before making a decision, make sure that whatever you choose is made from lightweight and breathable material. During the hottest weather, get ready with an outfit that can protect yourself from the harmful weather element. All our listed shirt will keep you ventilated and comfortable. You’ll feel like wearing nothing. Don’t let your poorly chosen outfit to ruin your entire day. Share your experience with our listed best shirts for hot weather in the comment box below. That’s all for today; we’ll be back to you with another interesting topic.